The Solukhumbu District of eastern Nepal is where Mount Everest sits – or, half of it, as the mountain is actually right on the border between Nepal and Tibet. It’s comprised of two regions: Solu, at lower altitudes, and Khumbu, at higher altitudes. 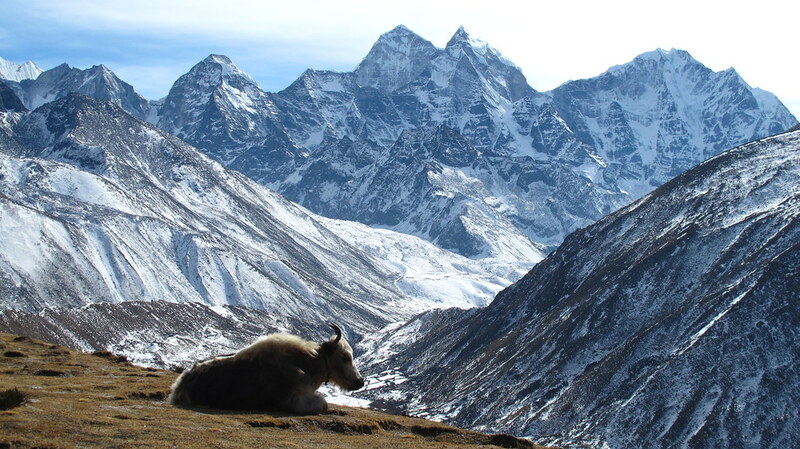 The Khumbu Valley is where many of the popular treks in the region pass through. 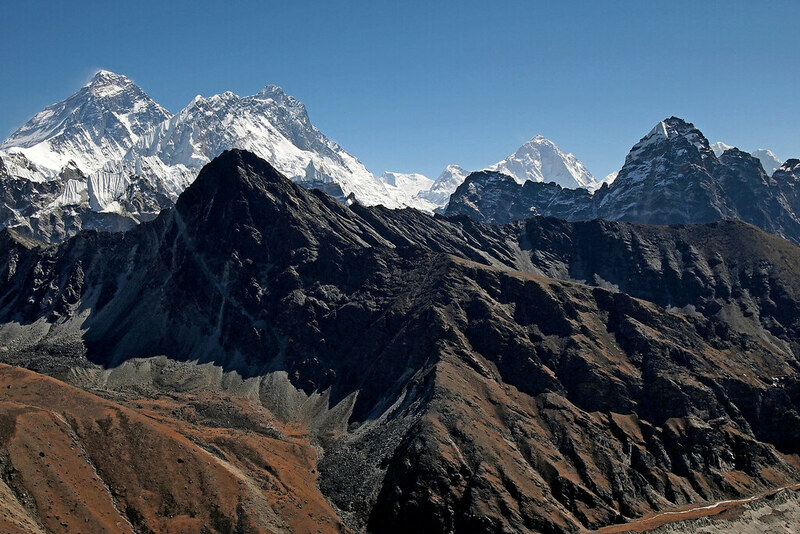 Solukhumbu is also home to the Sagarmatha National Park, a UNESCO World Heritage site. Most treks in/around Solukhumbu start with a flight from Kathmandu to Lukla, a small airstrip on the side of a mountain. But trekkers with a bit more time, or who want a bigger adventure, can take the “pioneers’ route” in, starting at Jiri and so-named because this is the way the early Western explorers in Nepal accessed the region before the airport at Lukla was built. There are lodges of all levels of comfort throughout the Everest region, from very basic to quite luxurious. One of the major drawcards of trekking in this region is that the infrastructure and level of comfort is better than in most other parts of Nepal. While travellers shouldn’t expect five-star comfort of the sort found in Kathmandu or Pokhara, there are still some extremely good accommodation options that come with tastefully decorated rooms, comfortable beds, heating in the form of electric blankets, hot water, and delicious food. It’s much easier to enjoy walking for several hours per day in challenging conditions if you’re well-rested! Yet, there are still plenty of budget options in the Solukhumbu area. This is a classic trekking route, and for good reason. The sense of adventure and feeling of accomplishment as you stand at the foot of the tallest mountain in the world is practically unparalleled. But it’s not just the end goal of reaching Everest that is so rewarding. Along the way are stunning views of other mountains (such as Ama Dablam, often called the most beautiful mountain in the world), fascinating Sherpa culture (especially in towns such as Namche Bazaar and Khumjung), varied flora and fauna (including the iridescent danphe, Nepal’s national bird), ice-cold rivers and dramatic suspension bridge crossings. EBC can be completed in as few as 12 days, but up to 16 allows for better acclimatisation and more contingency days. While practically everyone who undertakes the EBC trek will have a good time, the reasons not to trek this one but to opt for an alternative in the region are also many. EBC can get pretty crowded in the peak season, due to its popularity. You’re very unlikely to have any trails to yourself. Plus, this is an in-and-out trek, meaning you have to retrace your steps on the return journey. While the nature of the geography and access points/trailheads in this region makes retracing your steps unavoidable on many routes, this is something to keep in mind when designing an itinerary. Also spelled ‘Thangme’, the Thame Valley is west of Namche Bazaar. While some trekkers head up the Thame Valley as a side day trip to acclimatise before heading further into the Khumbu Valley, few overnight there, meaning you’ll get out onto some quieter trails and experience traditional Sherpa agricultural life and expressions of Tibetan Buddhism. A variety of wildlife can be spotted, including Himalayan tahr, musk deer and yaks. There are juniper forests, waterfalls and a number of monasteries to visit. The views from Renjo La (5400 metres) are superb. After a detour up the Thame Valley, trekkers can either continue on to EBC, or return to Lukla via Namche Bazaar for a shorter trip. This is idea for travellers who want to experience the Everest region but who don’t have a lot of time. All 6 days. 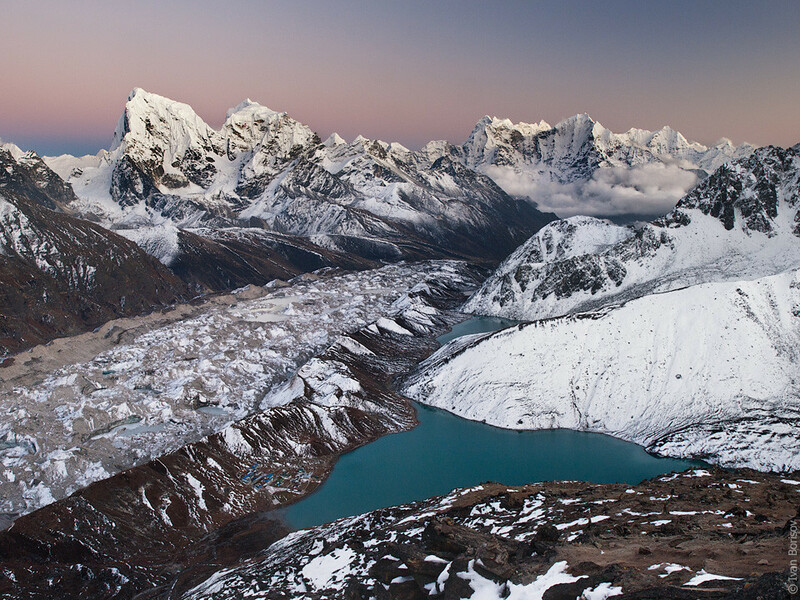 The Gokyo Lakes trek, via the 5330 metre Cho La (Pass), incorporates parts of the classic EBC trek but diverges after Namche Bazaar to the turquoise Gokyo lakes. It is a rugged and adventurous alternative to the popular EBC. You get the best of both worlds: a wilderness experience, plus the unmissable attractions of the classic EBC trek. The six glacier-fed Gokyo Lakes are a major attraction in themselves, and the views of Everest, Lhotse, Cho Oyu and the Everest Massif from Gokyo Ri (5360 metres), a peak above the lakes, are also some of the best in the Khumbu. While parts of this trek are demanding, plenty of time can be spent acclimatising. Fewer nights are spent at very high altitude than on the standard EBC trek. Allow 14 days. The Three Passes trek essentially combines the Everest Base Camp trek and the Gokyo Lakes-Cho La Trek, including some of the best features of both. From Namche Bazaar, veer off up the Chukung Valley. The three passes crossed are Khongma La, Cho La and Renjo La. Visit the gorgeous Gokyo Lakes, and climb Chukung Ri (5550 metres), Kala Patthar (5545 metres) and Gokyo Ri (5430 metres) for views of Everest, Lhotse, Makalu and Cho Oyu. This trek is challenging, and should only be attempted by experienced trekkers who have already done a number of high-altitude treks, as several days are spent above 5000 metres. Allow 19 days for this trek. 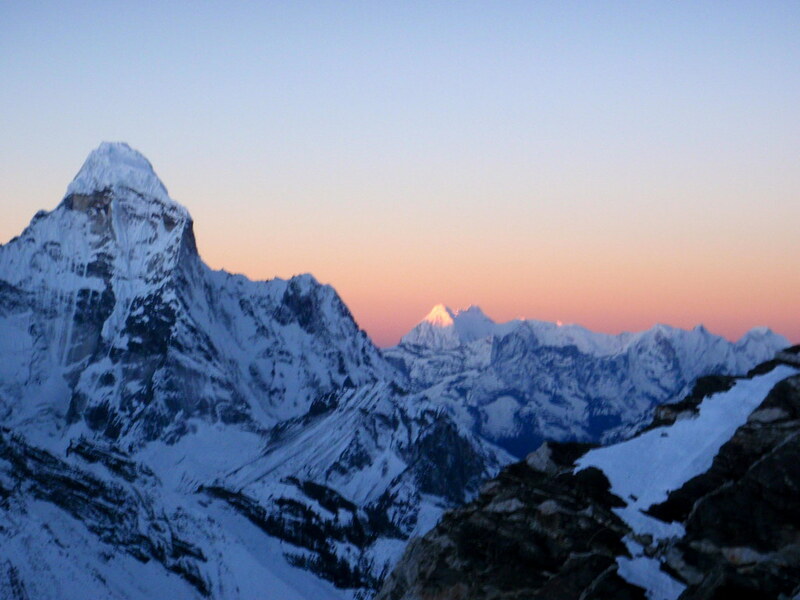 Nepal has a category of mountain categorised as ‘trekking peaks’ for the purposes of permits. Climbing them does not require an expensive mountaineering permit, but still requires significant preparation as they are more than just a walk up. Mera Peak is one such trekking peak, the highest at 7000 metres, and getting there requires trekking through the gorgeous Hinku Valley. In fact, it’s not even necessary to climb Mera Peak at the end of the valley to enjoy this trek, but it is an option for groups of travellers with mixed abilities/ambitions.The Hinku Valley is reached by heading east from Lukla. The trek to Mera Peak Base Camp passes through rhododendron forests (which bloom in the spring), meadows and lateral moraine. This trek doesn’t require retracing the route back to Lukla, as you can cross the Zatrwa La to head back to Lukla. Allow 20 days for this trek. Unlike most treks in the Solukhumbu area, this one doesn’t begin at Lukla. The Arun Valley lies between the Sagarmatha National Park (to its west) and the Makalu-Barun National Park (to its east), so the trailhead is at Tumlingtar, a small airstrip reached from Kathmandu. The first week is spent trekking through hill and valleys with very few visitors. It is a culturally interesting trek, because while the Khumbu area is dominated by Sherpa people, the Arun Valley is also home to many Rai, Chhetri and Brahmin people. The trail then joins the main EBC trail, for the impressive views of enormous mountains found on this trek. It ends at Lukla. Allow 23 days. Discover our trekking in Nepal trips and other Nepalese adventures.